What is happening to YOUR final salary pension? Final Salary pension schemes (also known as Defined Benefit Schemes) in the UK provide good benefits, indeed even generous benefits especially for those who spend most of their working life with the same company. The schemes give an undertaking that a member will receive in retirement a pension that is a proportion of their final salary with the company, up to 2/3rds of their salary. Members often contribute to the schemes but the legal responsibility for funding that pension undertaking is with the employer. The trustees of the scheme have to ensure that it is administered and invested in a manner that benefits all the members. Where a company can no longer meet it’s obligations to the pension scheme the fund goes into the Pension Protection Fund (PPF). This was established under an act of law and is therefore referred to as a Government backed scheme. In fact, the PPF is paid for by the remaining final salary schemes paying a levy. The scheme worked well when there was just a few schemes that went into the PPF. There is now a systemic problem for both the pension schemes and the PPF. In what is being described as a perfect storm of very low interest rates, difficult investment conditions, a huge increase in life expectancy and companies margins being squeezed making continued contributions to the pension more difficult. 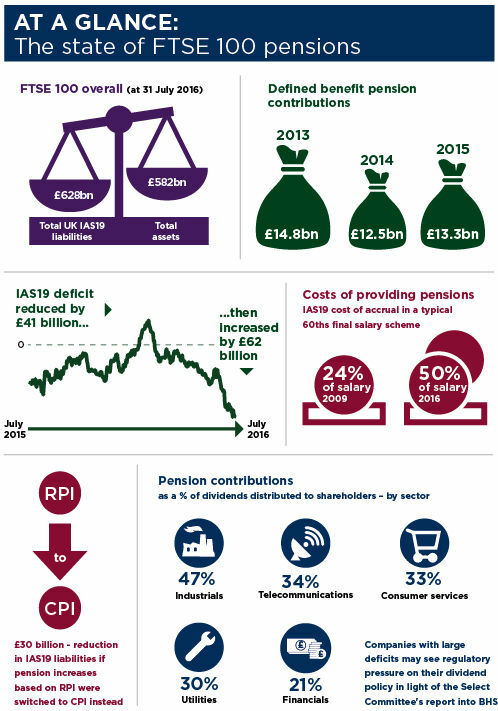 Actuaries forecast that in the worst case the pension funds are nearly £1 TRILLION short. Action is needed by Government and pension schemes. Some changes to pensions have already been implemented with surprisingly little complaint from members. This is because final salary pensions are complicated and are not understood by their members. As an example, a recent change to the rate of increase applied to some pensions from Retail Price Index (RPI) to Consumer Price Index (CPI) means members lose up to 25% of their lifetime pension. Withdrawals from the public service pensions such as the Teacher’s Pension Scheme have already been blocked since 5th April 2015. It is possible that this blocking will be applied to all final salary schemes as once the members are stuck in the scheme, reductions can be applied to benefits without the members voting with their feet. A significant aspect of the situation with these pensions is political. The cost of a rescue of these pensions at a Trillion pounds is three times what it costs to bail out the banks. By bailing out the banks it saved the whole banking system and was for the benefit of the whole country. Yet the members of the final salary pensions represent only 17% of the UK population. If the pensions went bust it would have a devastating effect on those 17% of the population but would not affect the other 83%. Is it politically possible for a UK government to spend three times as much as the bank bailout to save 17% of the population? Not all schemes are bad. Some 17% of the schemes are not in deficit (They currently have enough money to meet their pension liabilities). Also, to be fair, if investment returns were to get better the deficits on the other schemes may come down somewhat. However, changes are coming as the situation is very difficult. Once the changes have been put in place members will simply have to accept lower pensions than they have been promised. It is possible to do something about this although this will not necessarily be appropriate for everybody. We strongly recommend that you have your final salary pension reviewed by suitably qualified experts as soon as possible to give you an objective view of your pension prospects before the Pension rules are altered once again. Please note this article is not a recommendation. Your own particular circumstances have to be considered and advice specific to you has to be provided by a suitably qualified individual.